Customized mugs are SO easy to make. Easy enough that kids can make them. 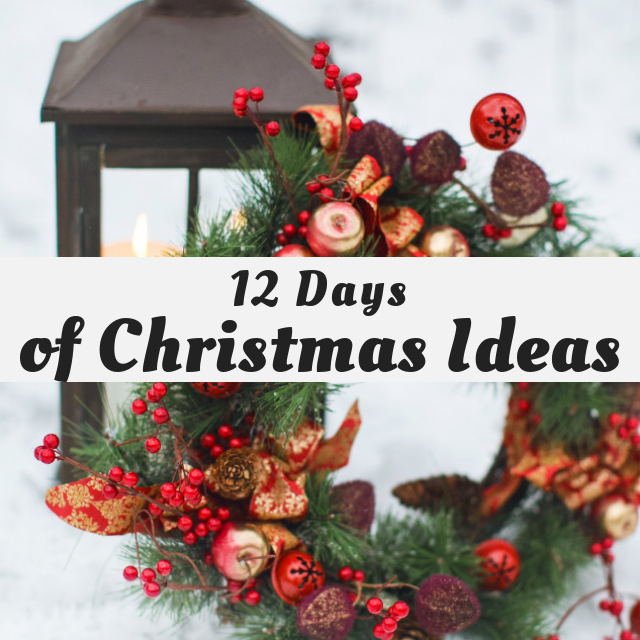 Give them as a gift to a friend, family member or teacher. You can personalize them with pictures, names, dates, etc. Add your own flair and personality to each mug - it's sure to be treasured by the recipient. Several years ago, our family started a new Christmas tradition. Instead of having the kids pick out gifts from the store for each other, they make each other gifts. This is more work for me, since I often help them come up with ideas and then help them make the gifts. However, they are SO much more excited to GIVE their presents. And that's exactly what I'm trying to teach them. Giving should be more of a focus than getting. They, of course, are still excited about opening their own gifts, and aren't always focused on giving. But they're learning. Two years ago, my then 9 year old made these mugs for her siblings. It's an easy project, that she did mostly by herself. Once she was done with the artwork, we baked the mugs to seal the marker paint. 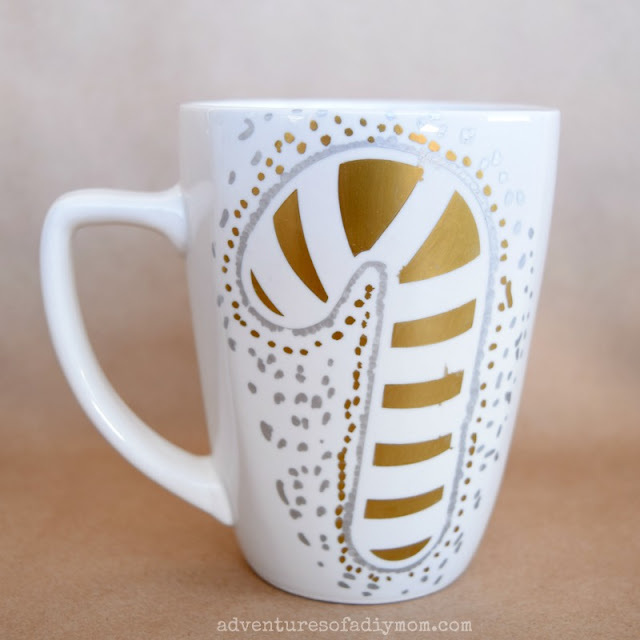 I did a little research about sharpie mugs and found this awesome blog post from Destination Decoration. She tested out different temperatures and times to bake the mugs to avoid color changes and to see what held up best when washed by hand and in the dishwasher. 1 - Wash and thoroughly dry the mug. 2 - Determine the shapes/design you want to use. We decided on four different Christmas shapes we wanted and then cut them out with vinyl using my Silhouette machine. You can cut shapes out by hand, or use stickers. I liked the vinyl shapes because it allowed for a little more detail. 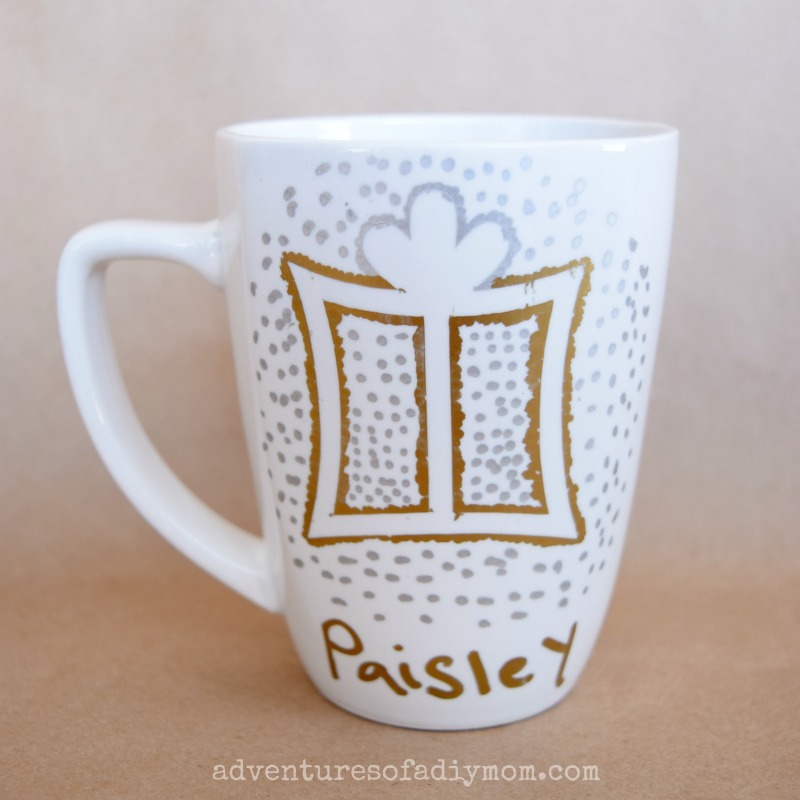 3 - Apply the stencil to the mug. Rub sticker all over to be sure it adheres firmly to the mug. 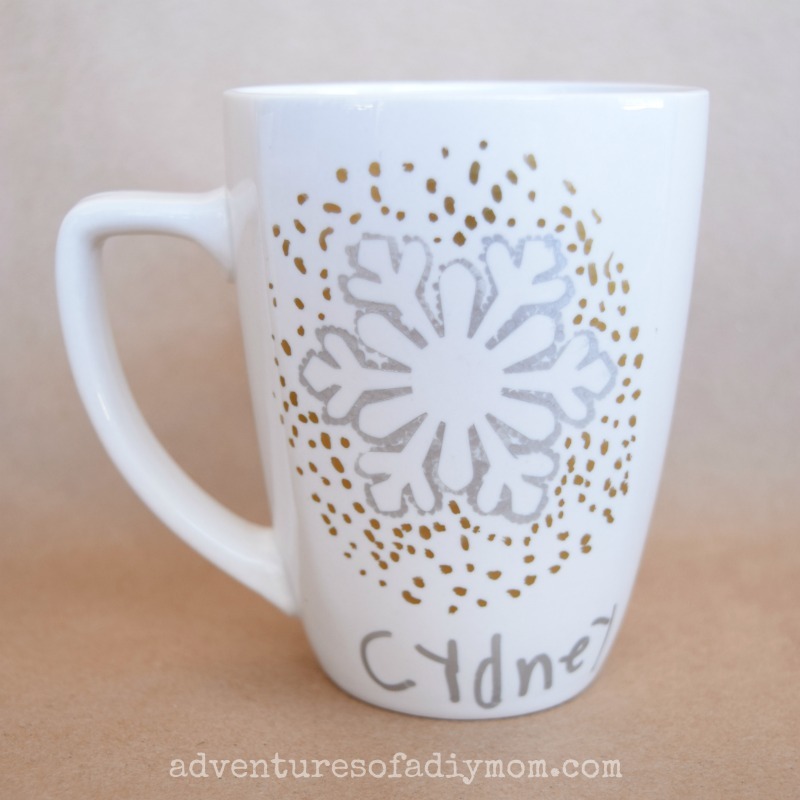 4 - Using the paint markers, apply dots all around the outer edges of the stencil, outlining the shape. 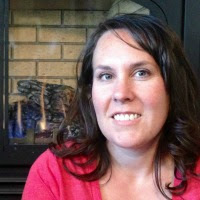 5 - Add other details, such as a name, date or more designs. My daughter went to town with additional dots around the shape. 6 - Let dry completely. 7 - Bake at 250 for 2 hours. 8 - Once baked, the mugs should be sealed and ready for use. They should be top rack dishwasher safe, but we always hand wash ours just to be sure. I've always wanted to try these - love how yours turned our Rachel! 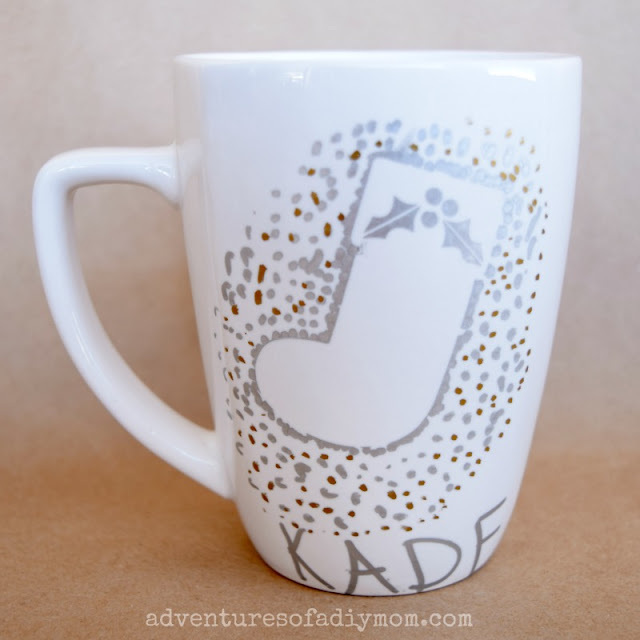 These are sooo cute and I love that kids can make them too! 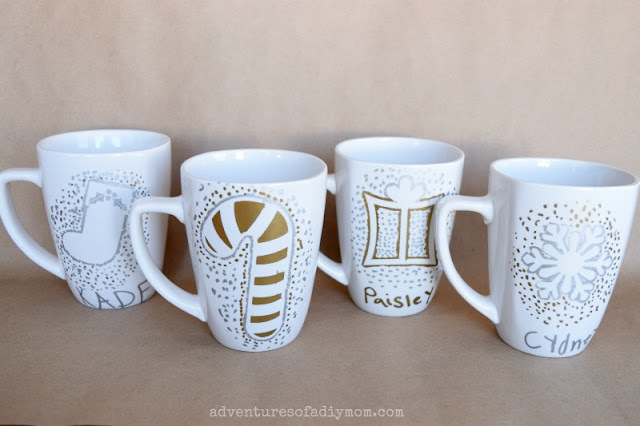 I love a cute mug, and these are sooooo cute! I really like the candy cane mug! These are super cute! 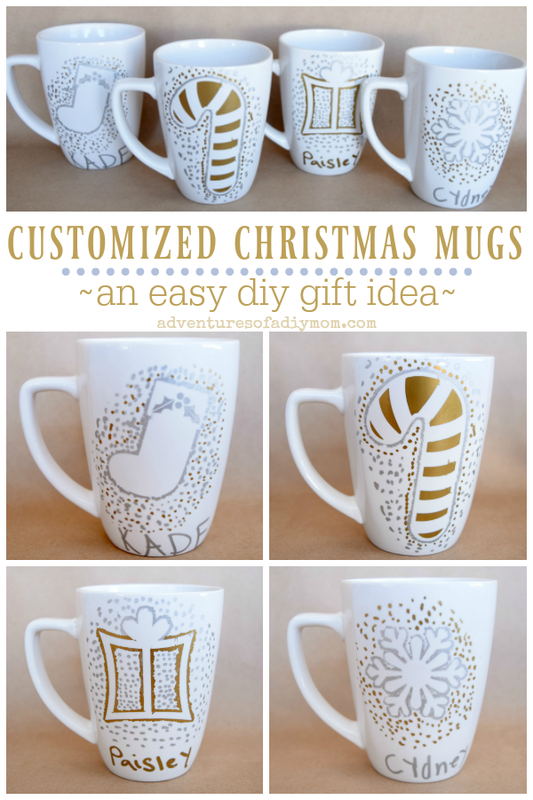 I love the idea of making homemade gifts for each other, what a wonderful tradition! This is such a sweet idea!! They sure would make great gifts for teachers! !